The government RDA is 400 IU, this is way too low! Most adults need to supplement 2,000 – 5,000IU per day. Use an at-home test kit and find out what your levels are running. Milk is not the answer to Vitamin D! For example, a glass of milk has only 100 IU Vitamin D3, you would need to drink 40 glasses of milk to get the recommended amount. Supplement with Vitamin D3 capsules, olive oil based. Take Vitamin K2 along with D3! I like the Life Extension product for K2. Or, buy a product like D3 Complete which combines D3 and K2 in a single supplement. I recommend adults take Vitamin D3 gel caps containing D3 with olive oil, not soybean oil or other junk oil. African Americans are much more likely to be vitamin D deficient because of skin pigmentation. It is the sunshine vitamin, and the best way to have adequate Vitamin D is to be out in the sun (without sunscreen) for 20 minutes a day. This is a simplistic view because there are several factors at play like skin color, geographical location, age, and time of year. You will find Vitamin D in salmon (530 IU) and cod liver oil (400 IU/tsp) with lesser amounts in the fat of grass-fed animals, organ meat, pasture-raised chickens and eggs. 75 percent reduction in overall cancer growth and 50 percent reduction in tumor cases among those already having the disease. ZRT home test kits are accurate and easy to use. A few drops of blood from a quick and nearly painless nick of the finger are placed on a filter paper to dry. This can be performed easily at home. The dried blood spot sample is then sent to a certified lab for analysis. No more wasted time and resources going to a lab for a painful blood draw. 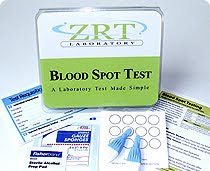 Once the lab has received your dried blood spot sample, your results will be sent to you via the mail in about a week.